Thank you so much! Lots of love is being poured into this game, and I hope you enjoy it when it's out! Fade — Ren'Py GUI Template community · Posted in Read Me & Quick Install! The opacity of the menu's overlay. Float. The background image for your main menu. Displayable. The logo of your game on the main menu. Ideal dimensions: 290 x 70. Displayable. The ycenter of the logo (how far down the screen it is). Recommended is 0.25. Float. Sound when a button is hovered. Path. Sound when a button is clicked. Path. Sound when a warning pops up, like when deleting a file. Path. Music for the main menu. Path. If you don't want voices, set this to False. The feature will also disappear from the Settings screen. Boolean. Text for the name and headers. Path. Text size for the name and headers. Integer. Text color for the name and headers. Color. The amount of pixels between each letter for the name and the headers. Integer. Sets names and headers to automatically be all-caps. Boolean. Text for the dialogue and paragraphs. Path. The replacement font for bold text. If you have a different font face for bold, put your normal font where "Nunito 300" is, and your bold font where "Nunito 700" is. The replacement font for italic text. If you have a different font face for italic, put your normal font where "Nunito 300" is, and your bold font where "Nunito 700" is. Text size for the dialogue and paragraphs. Integer. Text color for the dialogue and paragraphs. Color. The amount of pixels between each line for the dialogue and paragraphs. Integer. If you don't want a CG gallery, set this to False, and the gallery will disappear from the Extras menu. If you don't want a music room, set this to False, and the music room will disappear from the Extras menu. Clarity hotfix moving the save directory string to gui.rpy for easy changes. Tested and tuned for compatibility with Renpy 7.0.0. Simplified the installation process. Created more detailed documentation. Bug fix that caused CG Gallery images to render in the wrong position. 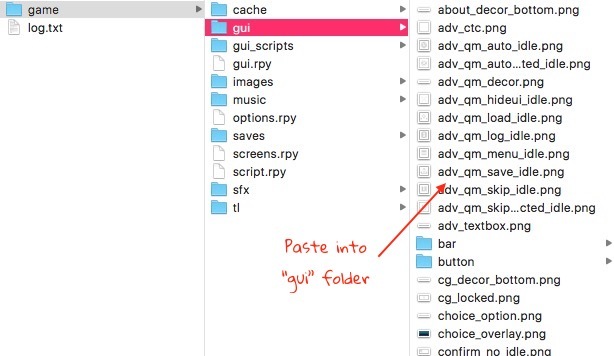 Fade — Ren'Py GUI Template community · Created a new topic Read Me & Quick Install! Renpy: Copyright 2012-2017 Tom Rothamel. 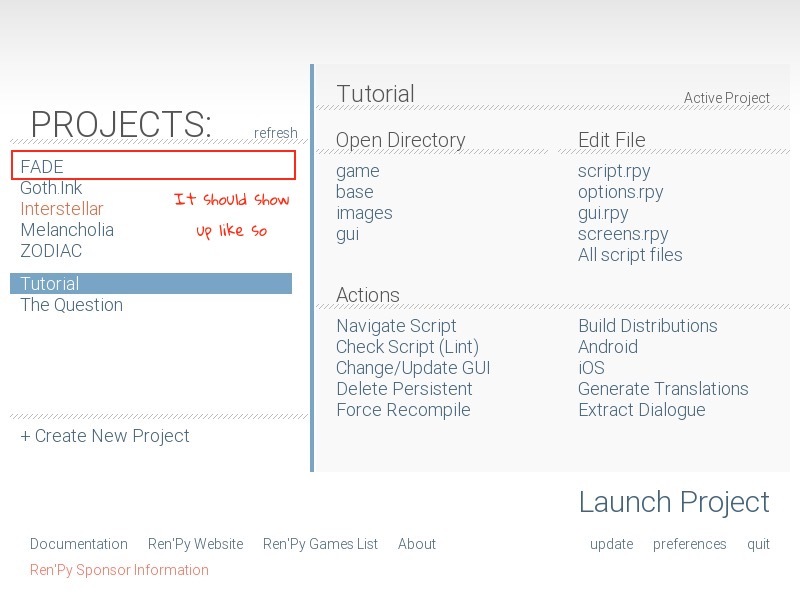 Open FADE.zip and drag the whole FADE folder into wherever you set your Ren'Py projects directory. Open the .zip of which theme you want: Mercury, Venus, or Neptune. Copy the files inside the desired theme's folder to FADE/game/gui. 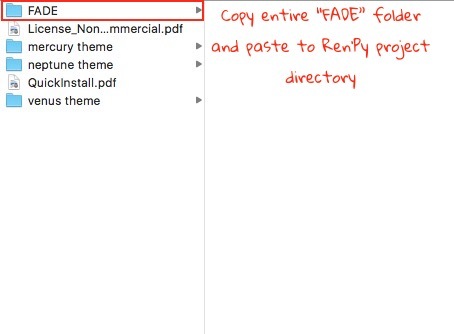 Copy entire "FADE" folder and paste to Ren'Py project directory. It should show up like so. 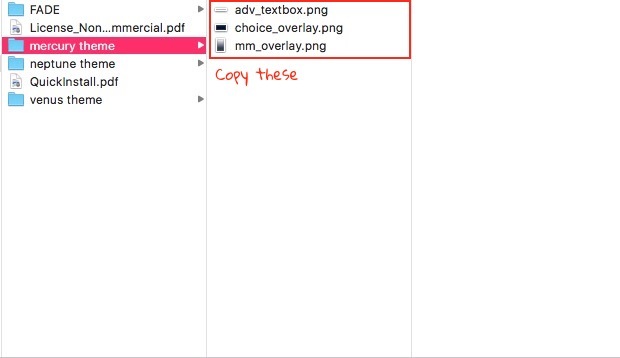 Copy the files of your desired theme folder. Paste the theme files into game/gui. For your convenience, the most commonly customized aspects are all placed under gui.rpy. Before you change anything, I recommend that you test your install to make sure it is successful. If you run into errors, try 1) deleting persistent, and 2) force recompile. Regarding the issues you reported, the save/load page refreshing every time was a bug that was fixed in later releases, so hopefully it shouldn't be a problem in the future! I'll also take a look at the cutoff buttons and the smallness of the arrows. Hey! Thanks for the feedback! I understand that my writing style didn't appeal to you. It's heavily inspired by spoken word and poetic prose, prioritizing the sense of rhythm, rhyme, and color. While this can come across as condescending or repetitive—since it's not as straightforward as direct prose—it's an artsy sort of style that calls back to indie films and Japanese cinematography, which the atmosphere of the visual novel is built on (hence the use of cinematic cuts, dictionary definitions, and other subtextual imagery). The writing can definitely be polarizing, but keeping its style is something that I feel strongly about, since it's the foundation of the game's vision. I understand if it wasn't your cup of tea, and I certainly don't expect it to be everyone's! As for Alison's fixation on normality, there's actually a specific reason that ties into the themes of the visual novel—though it won't surface until much later. Regarding subtext, while the visuals are meant to be artistic and subtextual, the actual dialogue is meant to be clear and easy to understand. There's copious amounts of foreshadowing and lampshading, but in the end, Alison is a straightforward protagonist who doesn't engage in subtext. Even when the Zodiacs ask her questions with hidden meanings, she tends to miss it and answers it literally. This does carry the risk of overexplaining, so we made the choice made after thinking of our target market. A lot of subtext is lost in the lack of body language / vocal tone in a visual novel, so as a result, the dialogue needs to be more literal. Thanks again for your honest thoughts and for playing the demo! Also Soundtracks Pt. 1 and Pt. 2 are available on digital music stores! But I digress, haha. Thank you for the support and the enthusiasm! Possible spoiler, but purchasing the dragon mask is not accessible at the moment since it's a True Route flag. Thank you for your enthusiasm and your support!